This apron has a soil release finish and gives you full length protection. Aprons available in many colors. The aprons were just fine except I wish someone would have suggested that my selecting black embroidery over the blue did not offer enough contrast. I should have gone with the white embroidery instead. 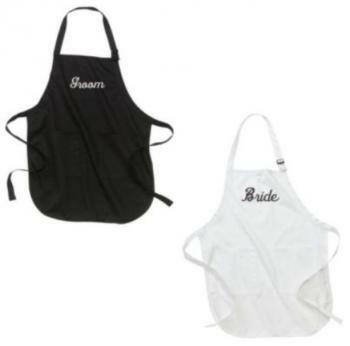 The word "Groom" is barely visible on the apron.